Q: Can a foreign individual or an organization purchase an apartment at Elysian Mirissa? A: Yes. Foreigners are allowed to purchase apartments from the fourth floor and above; according to government regulations. The entire purchase price should be paid by an inward foreign remittance. Q: Have all the necessary approvals been obtained for Elysian Mirissa? A: Yes. Necessary approvals from the Coastal Conservation Authority, Urban Development Authority, Condominium Management, National Building Research, Central Environmental Authority, Civil Aviation Authority, etc. have been obtained. Q: After buying an apartment, will I have freehold ownership? Q: When can I move into the apartment? 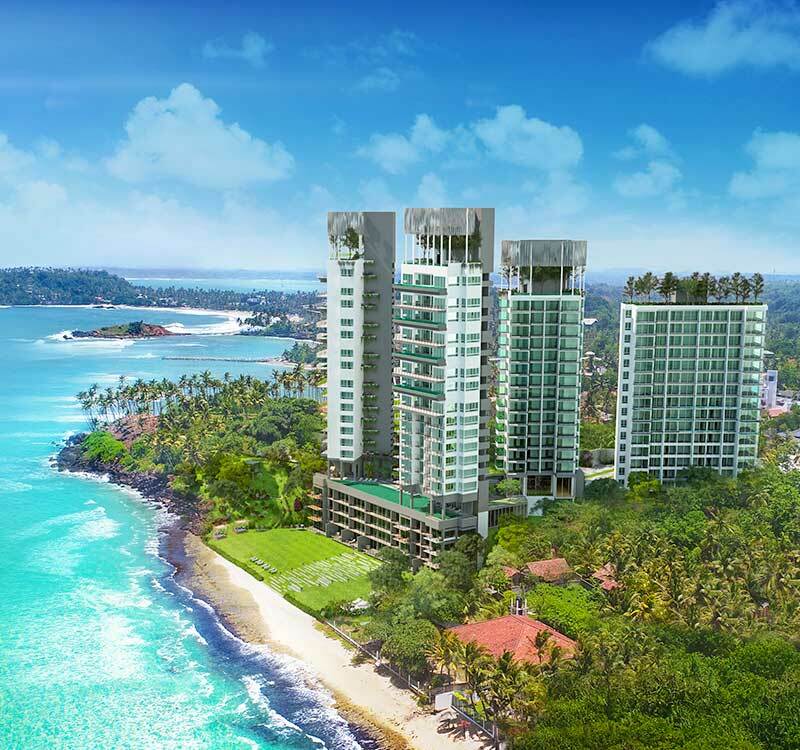 A: Elysian Mirissa is scheduled to be completed in 2021. After completion, you can move in immediately. Q: Which currency is accepted for payment? A: We accept US Dollars (US$) or Sri Lankan Rupees (LKR). The official Central Bank selling rate for USD / LKR will be used on the date of payment. Q: When will I be able to execute the Deed of Transfer? A: Once the full payment has been made for the apartment, and after the condominium plan or condominium declaration has been registered at the land registry, you will be able to execute the deed of transfer. Q: Does Elysian Realty (Pvt) Ltd. provide financing for this development? A: No. Elysian Realty (Pvt) Ltd. does not provide financing. However, there are financing facilities available through tripartite loan schemes via Sampath Bank that will allow you to finance the purchase of apartments under construction. In addition, Elysian Realty works with the major banks that provide financing for local purchasers. Q: Can I gain possession of the apartment prior to executing the Deed of Transfer? A: Yes. Gaining possession of the apartment prior to executing the deed of transfer is possible provided that the full payment is made and the vendor is notified to take over vacant possession. However, the deed of transfer will have to be executed within a specified period as given by the developer. Q: What are the security features of the building? A: CCTV cameras will be fitted in all common areas with a Building Management system. Q: What is the warranty period for the products and finishes? A: All products and finishes come with a one-year liability period for any defects from the date of project completion. Q: How many car parks are allocated per apartment? Will I be able to purchase additional car park spaces if need be? A: Those who purchase two and three bedroom apartments will be given one car park slot. Those who purchase four and five bedroom apartments will be given two car park slots. Unfortunately, there is no option to sell additional car park spaces. Q: What are the running costs that I will incur on a monthly, quarterly, yearly basis? A: Costs include service charge, insurance, municipal rates, utility bills and sinking fund contribution. Q: What are the other costs incurred when purchasing an apartment? A: 4% stamp duty paid at the time of deed of transfer, and legal fees for S&P execution. Any changes in taxes will be applicable. Q: Do foreigners incur any additional tax? A: No. However, it is recommended that you check with your tax consultants regarding the tax implications in your country of residence. Q: How does a foreigner pay for the apartment? A: As a foreign individual, you will first have to open an SIA (Securities Investment Account) with any Commercial Bank in Sri Lanka. Upon your instruction, the bank will settle the developer from your SIA. Q: Is there any restriction for repatriation of sales proceeds once the apartment is sold? A: Provided the payment for the apartment was paid through the SIA account, initial investment and capital gains can be repatriated through the SIA account back to your country of residence without any restriction. Q: Is there any restriction on the repatriation of rental income? A: No. Provided you repatriate your rental income via your SIA account. Q: Is financing available for foreigners to buy apartments in Sri Lanka? A: Currently, foreigners are not allowed to borrow money in Sri Lanka for apartment purchases. Q: Would I have to pay income tax on my rental income? A: Yes, at all the applicable income tax rates. Q: Who will manage Elysian Mirissa after the completion of the project? A: Elysian Mirissa will appoint a special administration team with the required credentials and expertise to manage the day-to-day activities of the condominium. With the experience of Elysian Realty in handling several large-scale local and international projects of this nature, systems will be put in place to ensure the proper management of this property.